Caf President Issa Hayatou says new Fifa President Gianni Infantino has the 'continued support' of Africa. Issa Hayatou, the head of the Confederation of African Football (Caf), has formally written to Gianni Infantino to congratulate him after being voted in as the new president of football's world governing body Fifa. Infantino succeeds fellow Swiss Sepp Blatter, after polling 115 votes, 27 more than closest rival Sheikh Salman bin Ebrahim al-Khalifa, at Friday's election. Infantino was not the favoured candidate of Caf, who had given its backing to Sheikh Salman. "Be assured of the continued support of Caf, African members of the new Fifa Council, as well as our commitment to strengthening the excellent relationship between Caf and Fifa," Hayatou wrote. 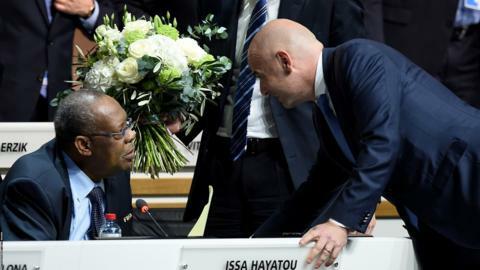 After his victory, Infantino promised to restore the image of Fifa, and Hayatou backed him to fulfil his pledge. "We are confident that you will restore Fifa's image backed by your career, skills, passion for football, understanding of the issues related to the future of football, and your desire to develop our sport around the four corners of the world," said the Caf President. With 54 member African confederations able to vote in the presidential election - more than any other Fifa region - Caf's support for Sheikh Salman installed the Bahranian as a favourite to win. But in the lead-up to the election, some African federations confirmed they would not be following Caf's directive, including Liberia, whose FA Chairman Musa Bility claimed that 26 African FA presidents had told him they would not be voting for Sheikh Salman.